If you read my flog, you know that I love biscuits. 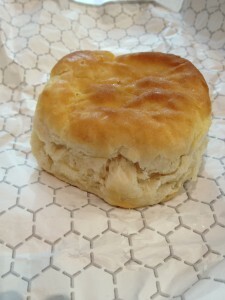 Tender, fluffy, flaky, buttery biscuits start calling to me as soon as I cross the Mason-Dixon line. 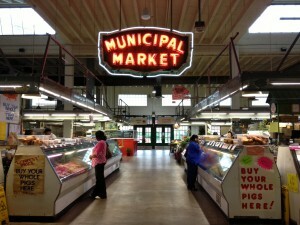 I arrived in Atlanta Wednesday evening and the next morning I walked down to the Sweet Auburn Curb Market, a public market that was established in 1918. There was not much open at 8am, but I was able to buy some Georgia peaches and other fruit. There are a number of food stalls in the market, including a highly regarded apreas booth, but only Metro Deli Soul Food was open. I wasn’t hungry, but when I saw the pan of biscuits, glistening with butter, I knew I had to have one ($1.5). It was only okay; it was a little squat and a tad tough, but I’ve discovered an “okay” biscuit down South still beats the pants off most Northern biscuits. I would definitely recommend wandering around the market if you are in the area. I had breakfast with my friend Doug at the Metro Café Diner (no relation to Metro Deli) and I had a basic cheese omelette ($6). 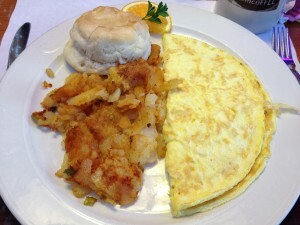 It came with home fries and they let me swap the toast for a biscuit (score!). My omelette was overcooked, but the home fries were good. The biscuit was not better than the one at Metro Deli Soul Food. I was battling 0 for 2. I was getting desperate; I was leaving Atlanta in 55 minutes and I still had not had a great biscuit. A fellow bridge player was on my flight and I mentioned I needed breakfast. She said that Low Country had “great grits and amazing biscuits,” Well, you don’t have to tell me twice. I got a single biscuit ($1.5) and she was right – it was excellent. 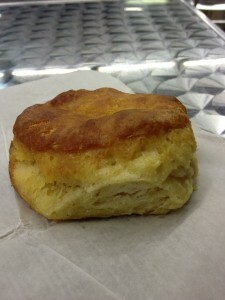 It was tender and buttery and I was finally able to leave Atlanta with my biscuit needs satisfied.